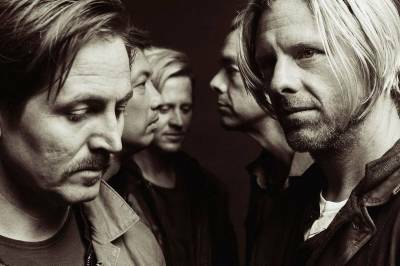 Grammy Award-winning rock band Switchfoot has managed to straddle the Christian/mainstream line since their mid-2000s hit songs “Meant to Live” and “Dare You to Move” hit the scene. Song placements in movies such as “A Walk to Remember” and "Chronicles of Narnia: Prince Caspian" have helped the San Diego-based group gain fame for their down to earth modern rock style. Switchfoot has never been known to broadcast their faith, but their contemplative God-centered lyrics have consistently revealed the purpose of their words. The band recently returned from a short hiatus with the release of their 11th studio album, Native Tongue. And, once again, they attained top rankings in both Christian and secular albums charts. Native Tongue secured the No. 1 spot on the Billboard Top Christian/Gospel Albums chart, but it didn’t stop there. The album also landed at No. 2 on Rock Albums, No. 3 on Alternative Albums, and No. 6 on Top Current Albums. Throughout their 20-year career, Switchfoot has gone on to sell millions of records, reaching both Christians and non-Christians alike. The band’s frontman, Jon Foreman, said he believes they've been able to reach a vast audience because of how they go about creating their content. "I don't see the boundaries, I look at people as souls that God loves all on their own personal journey," Foreman told The Christian Post in a previous interview. "My job is to love them and tell the truth. So what I do is I tell my own stories, being honest with your own stories is always acceptable everywhere. Everyone loves a good story!" While their music is popular among a broad audience, some religious fundamentalists who believe their music is influenced by Satan, have shown their disproval by protesting outside their concerts. In 2014, during their Fading West tour, Switchfoot’s stop in Baton Rouge, Louisiana, was met with protesters holding up large signs and shouting on megaphones. The protest was recorded and a video from that night went viral. Led by Chris LePelley, the protesters loudly shouted: “There won’t be Switchfoot [music] in Hell, just Switchfoot fans.” The group accused Switchfoot of furthering an evil agenda by mixing the things of God with the world, mostly their signature rock sound with Christian lyrics.